Metal Additive Manufacturing Symposium May 10, 2019! RAMP MD's Metal Additive Manufacturing Symposium is coming up on May 10, 2019, at the Towson University Building at Harford Community College. Register at https://3dmetalprinting.eventbrite.com. 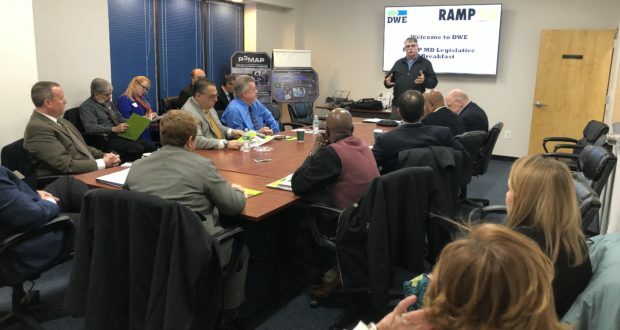 RAMP MD Executive Director Rick Decker explains RAMP MD's mission and next steps to local, state, and federal legislators and staffers on December 6, 2018. Dr. Eric Moore, technical director of Research, Development, Engineering Command Chemical & Biological Center, left, and Rick Decker, executive director of RAMP MD, sign a new partnership agreement that extends their collaboration through 2023. Regional Advanced Manufacturing Partnership of Maryland held its annual Legislative Breakfast on December 6, 2018, to brief local, state, and federal elected officials and staffers about the state of advanced manufacturing in northeastern Maryland and the new apprenticeship program that RAMP MD is exploring in conjunction with the Army. Read More. Educators from around the state of Maryland and Delaware came together for a workshop on “Teaching 3D Printing and Additive Manufacturing,” Thursday, July 26, 2018, at the Advanced Manufacturing Facility at Aberdeen Proving Ground. The goal was to help educators understand the value of additive manufacturing as a teaching tool and identify best practices for incorporating 3D printing into the classroom. Hosted by the Regional Additive Manufacturing Partnership (RAMP MD) and the Northeastern Maryland Technology Council, the workshop attracted over 40 teachers and administrators from K-12 school systems, community colleges, and universities in Maryland and Delaware. Read More. The Regional Additive Manufacturing Partnership of Maryland (RAMP MD) and the US Army codified a unique partnership on Thursday to provide 3D Printing resources to businesses and organizations looking to adopt additive manufacturing technologies. 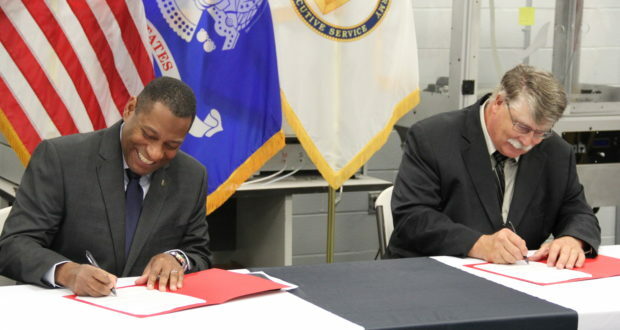 The official signing of a Cooperative Research and Development Agreement (CRADA) between the US Army Research Development and Engineering Command Chemical & Biological Center (RDECOM C&BC) and RAMP MD, took place on Thursday, July 26, 2018, with approximately 40 community and Army leaders and elected officials present. This agreement extends the partnership through 2023. Mr. David McGlone, deputy secretary of Labor, Licensing, and Regulation provided remarks at the ceremony, in addition to Senator JB Jennings, Delegate Mary Ann Lisanti, Delegate Andrew Cassilly, Todd Sabin of Department of Commerce, and Dr. Eric L. Moore, technical director of RDECOM C&B Center. Read Story. On July 26, RAMP MD is gathering educators from around the state of Maryland to discuss best practices in teaching 3D printing and additive manufacturing. Many school systems and universities already have created AM pathways to careers and incorporated 3D printing into classwork. We’ll hear from people how they are using 3D printing to teach other subjects and how they are teaching additive manufacturing concepts to students. The event will be held at the Edgewood Area of Aberdeen Proving Ground, July 26, from 1-4 p.m. Directions will be provided to registrants. Register at http://teach3D.eventbrite.com. Cost is free for educators. The Regional Additive Manufacturing Partnership of Maryland (RAMP MD) is working to build the additive manufacturing industry in Maryland through private-public partnerships. Through Symposia, tours, meetings, partnerships, we are building the nation’s most in-depth capability in additive manufacturing right here in Maryland. Additive Manufacturing has the potential to transform the way we live, work, and play. Sometimes called 3D printing, many industries are adopting additive manufacturing techniques, and producing medical devices, prosthetics, engines, automotive parts, food, buildings, toys, and much more. RAMP MD works to help Maryland businesses enter this new industrial age – developing public-private partnerships that add new capabilities and capacity to Maryland’s manufacturing sector. Edgewood Chemical Biological Center’s researchers use a multi-material 3D printer to produce numerous self-sealing suction cup prototypes. Additive manufacturing produces workable samples right off the printer. (Photo courtesy US Army). RAMP MD is on Twitter! "It’s possible that once more companies adopt metal 3D printing and fill their factory lines with the equipment, there could be more metal 3D prints occurring than thermoplastic objects." "VIP TIE is an Italian brand using 3D printing to develop fully custom tie designs which cannot be created through “conventional processes.” It offers clients the chance to design a truly unique 3D printed tie or...."
"The real shrinkage, however, comes when the “rough-sawn material” is sent to a planer, which rubs the surface of the wood down into the smooth shapes you can purchase at a hardware store."